Travis Pinkston cut his teeth on punk, alt rock and funk; Jane’s Addiction, NOFX, Fishbone, Fugazi, The Police and Sublime were just some of the bands on heavy rotation during his formative years. Andrew Kissel comes from a 90s alt rock background of bands like The Smashing Pumpkins and Deftones but changed his tune to artists like Stevie Wonder during college. Brian Yurachek got his hands on a Gene Krupa VHS that took his love for his first drum set, gifted to him at age seven, to a whole new level. 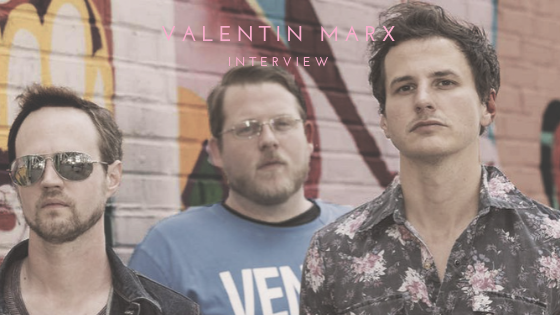 Together, the sounds of their influences make up Brooklyn’s Valentin Marx. Their latest single, “Made Up”, was the first song they wrote together after spending several years away and with their updated lineup. It was one of those songs that came together quickly and they knew that they wanted to bring it to the studio as quickly as they could. “[It] instantly became our favorite song to play live,” Kissel said. As far as writing in general, their songs take shape as they begin to play together. Kissel will usually have a basic template for a song, as far as structure and vocal melody. From there, Pinkston and Yurachek work together seamlessly to help Kissel establish and solidify the song’s feel. From day one they have played well together, and they use that to their advantage to create a song that best represents the three of them. For 2019, Valentin Marx is dedicated to focusing on writing and recording as much as possible. The band has found an energy and approach that is keeping their momentum going, and they just want to be able to share it with everyone.